This time, I’m not even going to pretend this is a review. This is a straight out plug for Happy Wackin’ Jim McCrackin, a show being put on by a theatre company my sister Kim is involved in called Accidental Humour. Remember, kids, humour has two “u”s. Kim is, as I understand it, one of the founding members. Based on a long phone conversation we had in January, their basic mandate seems to be to question what is currently considered Canadian theatre. Basically, to carry the label, a play generally needs to be about what it means to be different in Canada, and how individuals suffer for it. It’s about what it’s like to be a hyphen Canadian, like an Asian-Canadian, or a First Nations-Canadian, or a Fill in the Blank-Canadian. Our theatre is about guilt for how the European-Canadians have treated all the other hyphens, and how we should feel guilty about it. Which isn’t necessarily untrue. I love Sharon Pollock’s plays, which are very specifically exposures of the revisionist tendencies in Canadian history to match our perceived national identity. If you want that translated out of “Joey is a prick with a degree”, it means she shows us we aren’t who we think we are, and Canadians have really been jerks. Sometimes that needs brought up, but if you are a European-Canadian, and not one of the oppressed ones from Eastern European or Ireland, Canadian plays are telling you about how badly your people treated the other hyphens. As the descendants of the British and the Swiss, it can get to be a heavy load of guilt, and it’s easier to go to Shakespeare or Improv where no one expects an apology because of something our ancestors may have been involved in. There’s nothing wrong with telling these stories, but maybe, every once in a while, we could have a Canadian play that’s main theme isn’t about what makes us different. Maybe it should be about things we enjoy. We’re Canadians, and the things we like should entertain other Canadians. It shouldn’t be about some bigger cultural mosaic issue. Sometimes, Canadian plays can be about Canada today, not what someone’s grandpa did to your grandpa or how it was hard to look different from the other kids growing up. I’m as white as they come, but no one wants to watch my play about how hard it was growing up as a Geek-Canadian, with pants that were too short and an interest in science fiction and fantasy. Accidental Humours other mandate is to include multi media in their productions. This isn’t used in a Brechtian sense, to remind the audience that what they’re seeing isn’t real. It’s used to show parts of the story that are difficult to put on stage or to cover up the time it takes to change sets or costumes, or other … theatre things. I saw it in their last play, For Love of a Zombie. It’s more like watching a movie. Normally, when the technical demands of theatre would put a pause in the action, you’re watching more story on the screen. It shortens the run time, packs in more of a punch, and often has really interesting transitions. And unless you were involved in zombie romance, you weren’t asked to feel guilty. 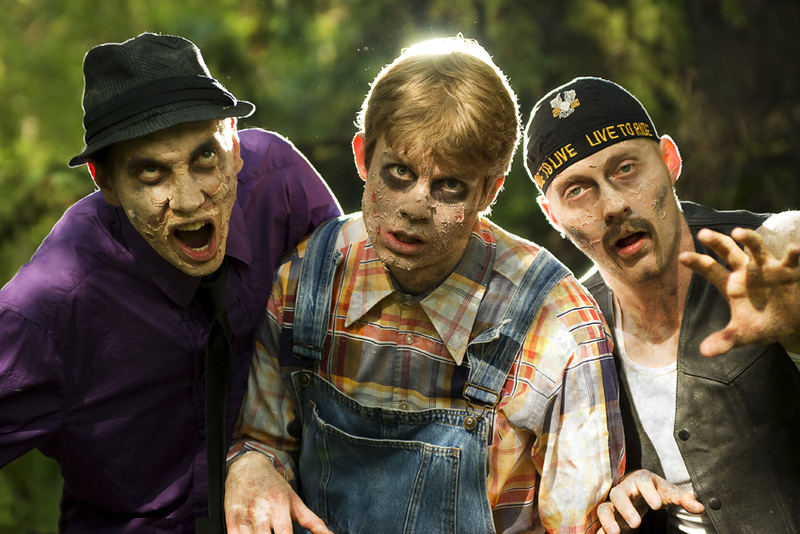 If you were involved in a zombie romance, you should feel guilty, and ewwwww. While I haven’t seen Happy Wackin’ Jim McCrackin, I heard a lot of the early stages. Amos wrote it in our apartment, and it was good when the workshopping started. It’s the story of a professional hitman on his last job, and some of the problems that arise out of it. There was a gay cat at one point, but I think that might be gone now. Still, it was really funny when I heard the start, and had some awesome action sequences. It’ll be even better now, as it’ll be further down the line, with more minds increasing its brilliance. It’s theatre for the masses, and you don’t need to know words like Brechtian to enjoy it. If you do, you’ll enjoy it too. It’s a smart action play. As opposed to all those mindless action plays…. I wish I had a chance to see it when it all came together, but I’ll be in England, and I can’t say that I’m really feeling the European guilt that leads to an apology on that. If I wasn’t travelling intercontinentally, I’d definitely be seeing this show, and if you’re going to be at the Edmonton Fringe you should definitely check it out. If you’re not going to the Edmonton Fringe you should reconsider, because it’s awesome. Unless you’re in England. Then you get a pass. If you’re there, be sure to check out to check out An Informative Guide on How to Climb the Corporate Ladder as well. Some might say its unethical to promote work done by your friends as an impartial view. I’m certain literary critics are friends with authors and that Ebert probably eats with Spielberg and Bruckheimer. So you can go talk to them about integrity. Besides, I’m being upfront about the fact that I’m friends with Gavin Williams. That doesn’t change the fact that his An Informative Guide on How to Climb the Corporate Ladder is a great play. In 2007 it won the Calgary Regional One Act Play Festival. And the Alberta One Act Play Festival. That means someone more impartial than me liked it best of all the other one acts. When I saw it at Loose Moose, there was a featurette attached called “The Receptionist” Lindsay Mullan performed physical comedy for about 10 minutes, alone on the stage with a single word of clearly audible dialogue. She was fascinating, bouncing around with unbounded energy, and every time I was certain there was nothing more that could be done with a strange and lonely receptionist, I was both wrong and entertained.Once Lindsay’s piece ended, the main play took to the stage. Gavin wrote, co-directed, and played to protagonist in “An Informative Guide on How to Climb the Corporate Ladder” so I feel very comfortable calling it his. It follows how one is hired, disillusioned, and stays with a terrible job in a huge company, tempered with Gavin’s caustic wit. The cast was perfect. All three members slipped in and out of the various roles assigned to them with ease. You never needed to guess who they were at any give point, as their demeanour and body language suited each role so completely. The set was simple and functional, as this is very much a one act festival piece. Everything was basic and multifunctional, so it was easy to set up and strike the set. The eerie part of the play is how well it predicts life with a corporation. It touches on every annoying aspect of that world, every justification you make to stay, every frustration that makes it nearly intolerable, and every shred of futile hope which paralyzes you into inaction. Kodie ended up with the exact same terrible shame as I did for making every one of the mistakes hi lighted in the play. We were entertained the whole way through, and harrowed when we really thought about the content of the piece. Basically, if you watch this play, you will want to quit your job. Of course, afterwards, when I told Gavin that, he told me the real message was “Joey, kill yourself.” That explains why he looked directly at me several times throughout and whispered those words, but I guess I missed the real message. If you missed the show here in Calgary, you’re not out of luck! Gavin’s taking it to the Edmonton Fringe Festival. It’s the coolest theatre event in Alberta. 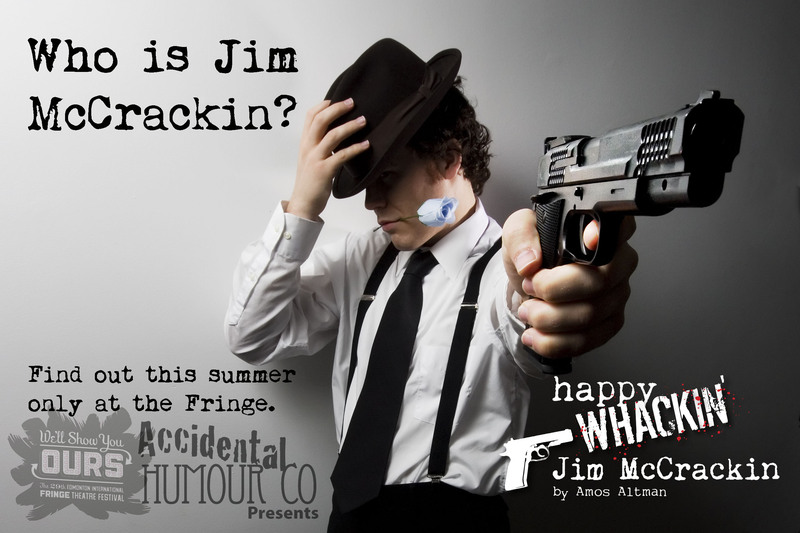 For more shameless plugs/shows I would definately see, check out Happy Whackin’ Jim McCrackin. You’ll here more about this play from me next week.